Major General Robert Gordon Owens Jr., a combat aviator who earned the Navy Cross and was designated a Marine Corps ace after shooting down seven enemy planes during World War II, was placed on the retired list, August 1, 1972. Born February 13 1917, in Greenville, South Carolina, he completed high school there in 1934, and was graduated from Furman University in Greenville with a B.A. degree in 1938. Enlisting in the Marine Corps Reserve in August 1939, he was assigned to the Aviation Cadet program in Pensacola, Fla., where he completed flight training. Upon graduation, he was designated a Naval Aviator and commissioned a Marine Reserve Second Lieutenant, June 7, 1940. When World War II broke out, he was attached to a Marine bomber squadron stationed at Pearl Harbor, and took part in the island's defense after the surprise attack on December 7, 1941. Later, as Executive Officer and Commanding Officer, respectively, of Marine Fighter Squadron 215, he took part in aerial combat in the Solomon Islands, New Georgia, and Bismarck Archipelago areas, earning the Navy Cross, the Distinguished Flying Cross with four Gold Stars, and the Air Medal with two silver stars in lieu of second through eleven awards. During this period, he was promoted to First Lieutenant in March 1942, to Captain in May 1942, and to Major in May 1943. He earned the Purple Heart for wounds received in action over Rabaul in January 1944. Although wounded, he succeeded in landing his crippled plane in the water where a rescue plane picked him up. He was later assigned to Marine Fleet Air, West Coast, as Commander of Marine Air Group Six that was deployed aboard ship. Following the war, he served with the Division of Reserve, Headquarters Marine Corps, for two years. In August 1948, he completed the Junior Course at Marine Corps Schools, Quantico, Virginia. He was promoted to Lieutenant Colonel the previous month. During the next two years, he served as Division Air Officer, 2d Marine Division, Camp Lejeune, North Carolina. From October 1950 until July 1952, he was assigned to Aircraft, FMF, Atlantic, at Cherry Point, North Carolina, serving consecutively as Commander, Marine Fighter Squadron 115, and Assistant G-3 Officer, 2d Marine Aircraft Wing. Completing the Air War College at Maxwell Air Force Base, Alabama, in June 1953, he reported to El Toro, California, serving as Marine Aircraft Group 15 Operations Officer and, later, Commanding Officer of Marine Attack Squadron 323. In May 1955, after completing helicopter training, he joined Marine Aircraft Group 16, 1st Marine Aircraft Wing, in Japan, and served as Group Logistics Officer and, later, Operations Officer. Returning to the United States in June 1956, he was assigned as Senior Marine Officer, Staff, Chief of Naval Air Basic Training, Pensacola. During this assignment, he was promoted to Colonel in September 1957. In February 1958, he joined FMF, Pacific, in Hawaii, serving as Deputy Assistant Chief of Staff, G-3, for two and a half years. 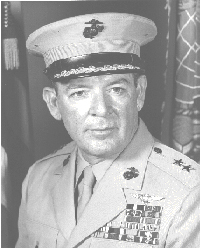 Remaining in the Hawaiian area, he assumed command of Marine Aircraft Group 13, 1st Marine Brigade, in August 1960. From September 1961 until August 1963, he served at Headquarters Marine Corps as Assistant Head, Plans Branch, G-3 Division. In June 1964, he completed the National War College in Washington, D. C., and received his Master's degree in International Relations from George Washington University in 1964. That August, Colonel Owens was assigned to the Joint Staff, Joint Chiefs of Staff, as a member of the Pacific Division Operations Directorate. He was promoted to Brigadier General, July 1, 1965, shortly after assuming new duties with the Joint Chiefs of Staff as Deputy Director for Command Areas, J-3. For meritorious performance of duty in the Pacific Division, and later as Deputy Director for Command Areas, Operations Directorate, he was awarded the Legion of Merit. Brigadier General Owens served as Deputy Director of Personnel at Headquarters Marine Corps from September until November 1966. Following duty at Headquarters Marine Corps, Brigadier General Owens was ordered to the Republic of Vietnam, where he earned a Gold Star in lieu of a second Legion of Merit for outstanding performance of duty as Assistant Wing Commander, 1st Marine Aircraft Wing (December 5, 1966-April 1, 1967) and subsequently, as Chief of Staff, III Marine Amphibious Force (April 2, 1967-December 19, 1967). Upon his return to the United States, he again served at Headquarters Marine Corps for 16 months, as Assistant Chief of Staff, G-3, and earned a Gold Star in lieu of a third Legion of Merit. While stationed at Headquarters Marine Corps, he was promoted to Major General, Sept. 1, 1968. After completing this assignment in May 1969, Major General Owens was transferred to the West Coast where he earned a Gold Star in lieu of a fourth Legion of Merit for exceptionally meritorious service as Commanding General, 3d Marine Aircraft Wing, Fleet Marine Force, Pacific, Marine Corps Air Station, El Toro Santa Ana, Calif., from June 1969 to April 1971. Major General Owens returned to the 1st Marine Aircraft Wing, now redeployed from Vietnam to Japan, this time as the wing's Commanding General, and served in this capacity until he retired from active duty. He earned his fifth award of the Legion of Merit during this assignment. A complete list of his medals and decorations include: the Navy Cross; five awards of the Legion of Merit; the Distinguished Flying Cross with four Gold Stars; the Air Medal with two Silver Stars and one Gold Star denoting subsequent awards; the Purple Heart; the Navy Unit Commendation; the American Defense Service Medal with Base clasp; the American Campaign Medal; the Asiatic-Pacific Campaign Medal with four bronze stars; the World War II Victory Medal; the Navy Occupation Service Medal with Asia clasp; the China Service Medal; the National Defense Service Medal with one bronze star; the Vietnam Service Medal with one bronze star; the National Order of Vietnam Medal, 5th Class; the Vietnam Cross of Gallantry with Palm; and the Republic of Vietnam Campaign Medal. Major General Owens and his wife, the former Frances Hart of Greenville, South Carolina, have two sons: Robert G., III, and Stanley H. Major General and Mrs. Owens are presently residing at 730 Amicus Avenue, Newport Beach, California 92660. The President of the United States takes pleasure in presenting the Navy Cross to Robert G. Owens, Jr. (0-6308), Major, U.S. Marine Corps, for extraordinary heroism and distinguished service in the line of his profession as Commanding Officer and a Pilot of Marine Fighting Squadron TWO HUNDRED FIFTEEN (VMF-215), Marine Air Group FOURTEEN (MAG-14), FIRST Marine Aircraft Wing, in aerial combat against enemy Japanese forces in the Solomon Islands and Bismarck Archipelago Areas, from 5 January 1944 to 15 February 1944. A brilliant leader and aggressive airman, Major Owens executed numerous combat missions against the enemy, frequently in the face of heavy hostile antiaircraft fire and strong aerial opposition. While carrying out these vital assignments during this period, he shot down seven enemy aircraft and probably destroyed five others. Maintaining his squadron at the peak of combat readiness through an efficient training schedule for pilots, he contributed materially to the outstanding success of his squadron in inflicting extensive losses upon the enemy and in providing effective fighter cover for our bombers. By his valiant leadership and unwavering devotion to duty, Major Owens upheld the highest traditions of the United States Naval Service. General Owens was laid to rest in Arlington National Cemetery on 18 January 2008.